I am actually still working on the puerperium cardigan but rather than sure the same wip with you two weeks running, I thought I'd start working my way through the huge pile of months/years old wips I have stashed away. This is the nimbus cardigan by the berroco design team, I found on ravelry whilst looking for something to cast on quickly before a knit and natter morning, as a result of this I didn't think to alter it in to an 'in the round' project instead of a pieced one. 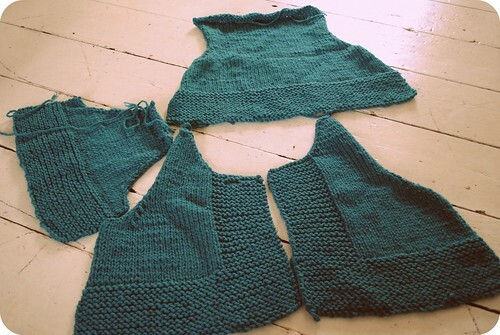 Since I learnt to knit on circular needles I do not like knitting like this not one bit! Why would you want to sew all those seams together when it's not necessary. I am fairly sure this is why this project (originally intended as a christmas gift for my Mum) has been abandoned. I finished the knitting part ages ago, much before christmas, I even purchased a lovely button from cariad clay to add a fabulous finishing touch, but the sewing up has remained ignored. My Mum has even seen the pieces now and declared she very much likes it, so really there is no excuse for this poor cardigan's complete abandonment. My Mum will be visiting this weekend, therefore I vow to finish it and share it on a FO friday post very very soon! Beautiful color for the Nimbus! You can do it, I know it seems daunting but I bet once you get started it won't be as bad as you think. So pretty! I find that working up the nerve to sew up the seams often takes longer than the sewing itself. I've had good results since I started following online tutorials for mattress stitching. Good luck! I wish I could knit! It'd be a shame not to get it finished when it's so close. The colour is beautiful! Like you, I'm also determined to finish some projects I've started a long time ago. The other day, while tiding up my kitting bag I found a scarf I started knitting way before I got pregnant... oh dear! 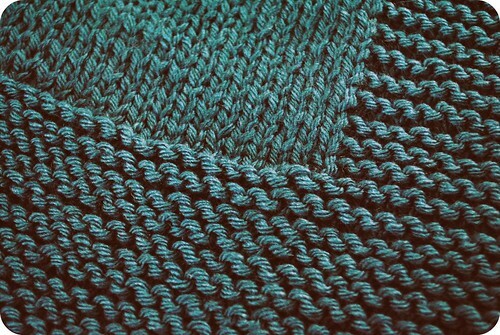 I love the colour of your yarn and it will be a shame not to finish this cardigan. I bet your mum will be so happy!